Lucky me, I was wrong! Dimension Drive sets itself apart from your average Space Invaders style shoot ’em up. In a comic book styled universe, you play as Jack, the last survivor of her race and the pilot of the legendary ship Manticore. You begin in World 1 (1.1), Jack’s home planet since she arrived in this dimension. It is located in the outer sector of Vain; The Seeker Gate being much faster and efficient than hyperspace serves as a transport means for spaceships. As you progress through the game, you will unlock sections 1.2, 1.3, and 1.4 of World 1 before continuing on the World 2 (an asteroid field too dense to cross at hyperspace speeds) and World 3 (a desert planet supposedly located somewhere within the asteroid field. Its exact location, however, is unknown. Upon diving into World 1, immediately a new ability is unlocked; Dimension Drive. This ability allows you to switch sides, teleporting across dimensions…and you will use this often. The game begins as your usual Space Invaders look-a-like except for one thing…it is split screen. No, this isn’t for co-op, you are both screens and you will use Dimension Drive to switch sides frequently to shoot enemies and collect data cubes. In your first venture into this dual dimension space, you will begin with one weapon equipped, High speed concentrated projectiles firing from dual or quad cannons. But hold on just a second…this isn’t just some shoot ’em up. Why are we blasting our way into interdimensional space and shooting everything in sight? I don’t want to just sit here and let my brain rot whole I could potentially be the bad guy for shooting something I shouldn’t (or should I?) No, there is a reason that Jack and the Manticore have been called to combat. Jack and her trusty A.I. Assistant V.E.R.A will need your help navigating through the split-screen dimensions and destroying swarms of alien spacecraft that has been sent by Niel’s to destroy everything in its path. Your mission, should you choose to accept it, is to help Jack find the origin of the Dimension Drive and find the truth of what happened to her people, the Dalkian’s. It sounds fairly simple and straight forward, but it isn’t…I promise. One of the great things about Dimension Drive is that you really get a feel for a very stylized comic book themed game. The cut scenes can seem a bit long, but they sucked me into the story pretty quickly, so it didn’t really bother me too much. I wanted to find out what happened next. Blast my way through Ashajul ships and find all the data cubes to upgrade my ship. This game will test what you really know about shoot ’em ups, though. With a clever mix of mechanics, each level is focused on strategic shooting and puzzles. The controls are easy enough (at least in the beginning). Y to shoot, B to jump to the other dimension. Conveniently, if you’re really into shoot ’em ups and don’t really care about the story, you can go into the settings and turn it off. Apart from Play and Options, your other category on your home screen is V.E.R.A, Jack’s A.I assistant. Checking this will help you along your way in the game as V.E.R.A will keep a log of the data cubes you have unlocked and what they are for. Also in V.E.R.A’s arsenal is a compendium of all of your enemies, what they are for, what types of weapons they have, and if they are immune to certain types of attacks. A quick read through of this will definitely give you a leg up in the game. You can either play the Campaign as a single player or you can do it as a Co-op, though I much preferred just playing by myself. As a not crazy fan of shoot ’em ups, I definitely found myself playing this much more than I thought I would. Not your average Space Invader’s remake, as it has split-screen simultaneous play, strategic shooting, and puzzles to solve to get your data cubes to upgrade your ship. With a comic book style story-line, it will keep you engaged to keep playing and find out what happens at the end. 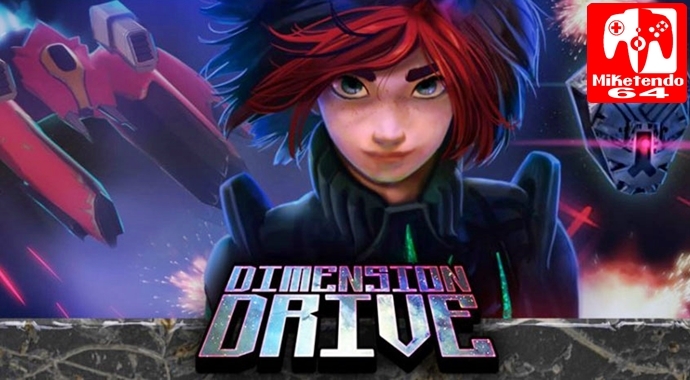 Dimension Drive is a game for both gamers who are and aren’t crazy about the genre. For more reviews by Mer, feel free to head on over to The Switch Effect!